Lakshman Kadirgamar is no doubt the most outstanding Foreign Minister Sri Lanka ever had, who did utmost justice for the task he was entrusted with. The eminent lawyer, Oxford scholar and illustrious humanitarian who entered politics later in life, had a clear and steady mission for his country when he took the baton in 1994. His dream was to build a multi-religious and multi-ethnic Sri Lanka where all communities could live in harmony, but the LTTE posed the gravest threat to this ideology. At a time when the LTTE was wreaking havoc in the country under the pretext of freedom fighters, Kadirgamar set out his difficult, but factual, campaign to reveal the true face of the terrorist organisation. Calling a spade a spade, he was successful in convincing many of the world powers to proscribe the LTTE including the US, while also attracting the world attention to the LTTE's abhorred practice of child soldiering. The soft-spoken, yet skilful orator could thus restore the image of a nation, once tarnished by the false terrorist propaganda. Having had many achievements to his credit, his was in every sense of the word a multifaceted career. Before taking up a political career on the invitation of former President Chandrika Bandaranaike Kumaratunga, Kadirgamar had practised as a distinguished lawyer both in Sri Lanka (then Ceylon) and the UK, served as a Consultant at the International Labour Organisation (ILO) in Geneva, and as Director of Asia and the Pacific at the World Intellectual Property Organization (WIPO). In 1988 upon his return to Sri Lanka, he resumed his legal career and was appointed President's Counsel in 1991. The tremendous experience he gathered while serving these international organisations would have undoubtedly helped him perform his ministerial post splendidly. Lakshman Kadirgamar was the Chairman of the Council of Ministers, South Asian Association for Regional Cooperation (SAARC) from 1998 to 2001 and the Chairman of the Indian Ocean Rim Association for Regional Cooperation (IOR-ARC) from 2003 to 2005. He was also a member of the Policy Advisory Commission of the World Intellectual Property Organisation. Kadirgamar simply amazed the world with his enormous wealth of knowledge in foreign affairs, legal thinking and jurisprudence. Performing his role skilfully in a position tailor-made for him, he showed the world the danger of isolating the terrorist activities in one country as it could become a global menace. The fearless, determined and democratic struggle he waged against the LTTE finally cost him his life, but his unparalleled contribution to safeguarding the unity, sovereignty and the territorial integrity of the country has certainly gone down in the annals of Sri Lankan history. The number of articles still written in appreciation of this eminent lawyer turned politician par excellence is a testament to the respect and regard with which he was held locally and internationally. The Sri Lankan Government posthumously awarded him its highest honour Sri Lankabhimanya. The legacy, which Kadirgamar left behind and the role model he was, will never be forgotten. On the occasion of his 11th death anniversary, the Daily News met with his daughter, pioneer media personality, Ajita Kadirgamar who also penned his father's biography in 2015 to revisit the life and times of the legendary Foreign Minister who truly made a difference. A shower of gunshots, a beeping ambulance, a shocking announcement and a grief-struck nation! The moment every Sri Lankan had dreaded, did unfortunately arrive, 11 long years ago, stealthily, in the most cowardly way, shrouded in the cloak of thick and cold night where no “heaven did peep through the blanket of the dark, to cry ‘hold, hold! '’ With uncertainty written all over their faces, the peace-loving Sri Lankans muttered to themselves in utter shock as to how ‘on earth’ this could have happened despite such tight security. Even after the media went agog with the news and when each minute detail of the heinous offence was revealed, they were still not ready to accept that ‘ít’ could have ever happened! They started blaming his security officials for undermining the security threat posed by the tall building in the vicinity of his residence! But quite soon the grief-struck Sri Lankans came to grip with the saddest truth; LK is no more! Back in 2005, a country without Lakshman Kadirgamar was unimaginable. A Cabinet without his magnificent presence was meaningless. Battling against the Tigers without his verbal force was a sheer dream. When the voice that roared against the LTTE was silenced by the very force who he fought against, the once hope-filled peace-loving Sri Lankans were left helpless! Tears rolled down the faces, white flags fluttered against the deep blue sky, condolence messages flooded in from all over the world. The then President Chandrika Bandaranaike Kumaratungea, still awestruck by intense sorrow, addressed a grief-struck nation to call Kadirgamar ‘a hero of our times, a true patriot and an idealist who spoke out against terrorism long before it became an anathema to the West.’ Delivering the oration at the state funeral, the then Prime Minister Mahinda Rajapaksa called upon ‘all countries’ to ‘join together to wipe out terrorism and strengthen the norms and values of democratic life.’ The world leaders too stressed the necessity to accelerate the elimination of terrorism. Eleven long years have passed since the tragedy. Much has been lost, much has been gained. Many lives have been saved, many lives have been lost. The LTTE has been militarily defeated. And Governments have been toppled. A totally different scenario! Had he not been brutally assassinated and been in good health, he would have been 84 now. If the man of intellect and integrity lived till 2016, what would he be doing now in post-war Sri Lanka? “Among many options that would have been open for him, he would have written a book, and I do think if he had quit politics, he would have had the grand idea of being involved in peacemaking,” says Ajita Kadirgamar still engrossed in deep thought as to what else her father would have been doing. An exceptional human being her father had been. An exceptional mind. A brilliant person he always was who would do very best for the country above and beyond the call and who still had so much more to offer. Yes. Had he lived today, we would have been richer in many more ways. The man, who left an indelible legacy behind, definitely would have had so much to offer. What if he had the opportunity to pen a research study on Sri Lanka's foreign policy or, how great it would have been had he lived to pen his autobiography - the life and times of an illustrious lawyer turned statesman? An unfinished journey with so many questions that would remain unanswered forever! Switching from an imaginary present, where her father never lived, to the actual past, Ajita paused for a moment, while recollecting their early days spent in the then Ceylon, the UK and Geneva in the 70s and 80s. Despite her father being always busy even while at home as he had his office/law Chambers in the house, she still remembered creeping in there or chatting to him! The next moment she blames her bad memory for not having recorded each minute detail of her great grand days spent with a legendary father. “The thing is I have a very bad memory. That's why I wanted to write the book [The Cake That Was Baked At Home] before it gets worse. I thought I should write them down especially for my son [Keira Perera] so that he knows the family history,” she said. Revisiting the few memories she had of her father in his early years in office was indeed a pleasant experience to her. “I mean I had a beautiful childhood here in Sri Lanka. I had the best of everything and the fact that my father's office was in the house was a big help. But then again he was going to Court - always travelling to Kegalle and all over the place. But I remember on Sundays he was there reading his papers and I used to hang around,” she reminisced. Birthday parties of yesteryear celebrated amidst her father's busy schedule (where one of them had to call him on the dot to cut the cake) still stand out in her memory. “Time to cut the cake, please come for the photo,” I remember calling him,” Ajita smiled still enjoying the memory. Lakshman Kadirgamar, wife Angela, Ajita and Sriraghavan, her younger brother (seven years her junior - fondly known as ‘Ragi’) left the Lankan shores in 1971 following the JVP insurrection. As Ajita writes in her father's biography the period in the 70s, in Ceylon ‘was a time of austerity within a closed economy.’ She was just 11 years then. She spoke in detail about the life spent beyond the Lankan shores in the West. “In 1971, first we went to England for three years. There again my father had to travel to London all the time, and always working!” said Ajita adding that her father was definitely a workaholic! “Wherever he went, he always had a study - a place to have his own time - and we were a little scared to disturb him. But in Switzerland when I was a teenager I really remember the special times on Sundays when he would drive to town to get the newspaper and I would go with him mainly to get a lift if I wanted to go somewhere or to get my favourite chocolate or whatever,” she reminisced. “When you are in a car with somebody you are stuck with that person. Whether you like it or not, even my son, when he was growing up if I wanted to have a conversation with him, I would do it while we were in the car, because he could not escape from me. This is what you call a captive audience! I remember my father and I chatting during that time and I have a lot of good memories!” she recollected. Ajita remembered his father as a ‘Wonderful man'. “All my friends, cousins and young people used to love him. He could talk about anything and could make anybody at ease,” she added. As Ajita recollected, her father was a person who never got angry or showed his temper. “He was a very calm person. A very strong, well trained, mind and nothing would get him off track,” she mused. Even though their lives changed drastically after her parents’ divorce and his father getting into politics, soon followed by his second marriage, she would still love to keep the early memories fresh in her mind. In her book, she has mentioned how she, yet a teenager, ‘scolded’ her father for being occupied too much with work. She shared more information about the ‘teenager adventure’ with the Daily News. She confessed laughingly that she had strong reasons to ‘pull him up'! “Over the years, my brother went to boarding school. So after a while, we were never all in one place at the same time. So up until I left Switzerland, that was the only time that we all lived together. So those times spent together were special to me,” she explained. At a time when online communication was not the common practice, letter-writing and telegrams were the popular modes available to exchange information and maintain ties with the loved ones. Ajita said that she was infinitely glad that she preserved the telegrams and letters sent by her parents when they were away. In a letter written to her by her father on December 9,1973, from Geneva while Ajita, mother and brother were still in Oxford, he had mentioned how thrilled he was to hear from her mother that she had been given a standing ovation at school for her speech on history. “Anything you do well - big or small - will always give me the greatest pleasure,” were the words of a hopeful and caring father who always wanted the best for his daughter. Reading the treasured old letters brings back to her mind, nostalgic memories of the bygone days where they were a well-knit family. Ajita still vaguely remembers their childhood trips to Pasikudah in the ‘60s while still living in Sri Lanka. At a time when there were only rest houses, not hotels and poor quality road systems, the life was still simple. “He used to love the water. He used to love to go swimming,” Ajita recalled. When the Kadirgamars were living in Switzerland, they used to travel a lot. “As a child, when we were in Europe we drove a lot because Switzerland is very central. We went on a trip to France driving through countryside,” she reminisced. Having occupied high positions in many international organisations, Kadirgamar was in constant contact with dignitaries from multiple communities. “Because my father was at UN, he knew so many nationalities and my mother also had many friends there. And we had a very mixed crowd of friends. We had a great life there, we were very social and used to have the most amazing parties. Summertime was always the best time of the year. They used to entertain guests in the garden who used to have long discussions with my parents,” Ajita recollected while also hailing her mother’s role as an amazing host! Geneva days had always been filled with fun, especially for their parents. She recalled how her parents used to stay awake talking to each other, sipping their glasses of wine, and his father smoking his cigar. “He would tell my mother everything because she was interested in politics and international affairs. As my father travelled so much he updated her on everything,” she said. 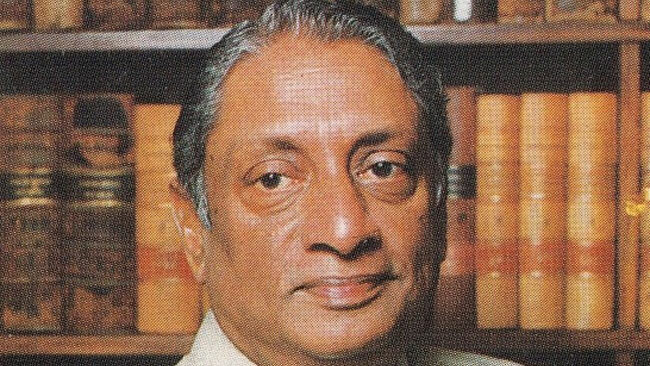 Lakshman Kadirgamar was the youngest son of Samuel Jebaratnam Christain Kadirgamar and Edith Rosemand Parimalam Mather, and was the youngest child of a family of six. His mother, however, passed away when he was barely seven years old in a tragedy ‘the family never really understood or recovered from'. Having been so close to his mother, her sudden death was such a shock to little LK. As Ajita wrote in his biography, many relatives, including her mother Angela, had believed that the intense grief he experienced following his mother's death would have taught him a lifelong lesson not to develop close and intimate relations with anybody! Bur LK, on the contrary, never pushed either his daughter or son to overachieve anything. His own personal experience would have perhaps been the reason why he let his children have their own choices in selecting a study stream or job. Her father had no objection whatsoever when she decided to take up job as a TV presenter, Ajita recalled. It was 1982 when Ajita came to Sri Lanka on holiday while still studying at Geneva University. “When dada was with the UN, every two years we got home leave just for a holiday and that's the time I got the job offer in Rupavahini. I went with him and I think he was happy because he realised that this should be my interest. When I think about that now, I realise that he was an important factor in that decision. So I don't think that he really minded that I didn't finish my degree,” she recalled. She took a stroll down memory lane to her youthful years at Geneva University to explain as to why she decided to choose the TV presenter job over degree! “He did not care what I studied, as long as I got a degree. Anyway, he was happy that I was at university and doing a degree and in the same way I feel about my son [Keira]. It is not important what you are studying, as long as you get the paper. Meanwhile, my brother was studying architecture all over the place. Now he lives in India. Actually, his architecture is less important now. He is now a spiritual awareness guru,” she added. While doing research for the book, Ajita came across many interesting accounts of his father written by former Trinitians. Writing the book was an education to Ajita as to who her father really was. “He was very modest. We knew that he was a hurdling champion and he did really well at school. But we didn't know all the little details - how he stood and spoke or how he asked the headmaster for extra holiday! All these little things he never really talked about. But I am sure he talked with his old school friends. They would have had great togetherness and they would have talked about the old days a lot. But with us he never really did and that's why I regret that we didn't ask more questions,” she said with little remorse. She is worried as her son too never asks any questions about the family and the past. “Maybe it's youth. Now my son is 26 years. He really doesn't ask questions about the family. And one reason why I wrote my father's biography was one day he may know who his grandfather really was. Maybe as children we just feel that we can ask the question later when they are older, but they [children] will never get a chance!” she sighed. “Family History is so important, it has to be passed on,” she added in a serious tone. The vision of Sir Ivor Jennings was to create in Peradeniya, a model of Oxford and Cambridge. In early 1952, LK was certainly lucky to be in the original batch of undergraduates transferred from Colombo to the brand new Peradeniya campus of the University of Ceylon. 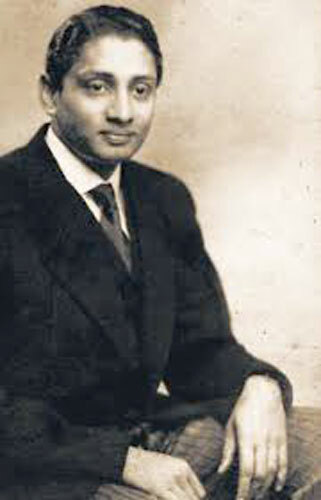 LK graduated from the University of Peradeniya in 1953 with a Bachelor of Laws (Honours) degree. He next moved to Colombo to join the Ceylon Law College at Hulftsdorp Street. Ajita recalled how she visited the University of Peradeniya, which beyond doubt was a magnificent citadel of wisdom located among the lush greenery, as she came back to Sri Lanka to retrace the footsteps left behind by his father. “It is such a beautiful campus. I am so lucky to have gone there. When I came back in 2013, I bought a property in Gampola, a tea estate. To come to Kandy- Peradeniya, you can take either the Kandy road or the road that goes through the university [through Galaha junction]. The first time I took that road was the first time I had actually driven into the university. And after having done research and read about it, it was so fantastic to see the university where I had never been inside. On another day I came back with my camera and I went to look for his hall [Arunachalam]. I took these photos [included in the book] during that trip. I could see the athletic track and I could imagine how he used to run,” she said fondly in a voice filled with nostalgia. She added that it was a fantastic voyage of discovery for her and she would visit there again to see if they had any photos (or anything) of her father taken during his stay in the Campus. LK's sporting achievements both at school and university were remarkable. “He used to talk about his sports days a lot and he even loved to watch cricket or rugby whenever he was here. I have a story of his friend's son, Chris, who used to play rugby in France and it meant so much to my father just to watch those boys playing rugby,” Ajita reminisced. As she recollected for 17 long years that he was in Geneva, he was so cut off from everything in Sri Lanka. Back in the ‘70s and ‘80s, there was not a big Sri Lankan community in Geneva. Hence her father missed his friends and many opportunities to go for a rugby or cricket match. LK was a man of many friends, Sri Lankans and foreigners alike. “His network was incredible and I never realised how much he had kept in touch with this people over the years,” Ajita recalled. Ajita recalled that Peter's was a name that her father talked about always. Former Minister Lalith Athulathmudali who was the first Sri Lankan to be elected as the President of the Oxford Union too was a cordial friend of LK who invited him to enter politics in 1977. “He came to my wedding. I knew they were good friends. But I didn't know the origin of their friendship or how far back it went was again discovery,” Ajita added. Her father had friends from many ethnicities, but they were all Ceylonese back then. Her father, according to Ajita, loved to talk about Oxford and she regretted not asking more from him. She recalled once again her childhood days spent in Oxford. Years from 1971 to 1974 must have been hard years for LK, Ajita observed. “It was mainly my mother who would pick us up from school. She would give us everything because he wasn't around. He used to go by train, then come back and get ready for the next day, in the night. So most of my memories of him are sitting at his desk with no typewriter, no computer. He was taking notes by hand while smoking his cigar. Pages and pages of notebooks and just the desk light. Sometimes he wouldn't even change his clothes, but would come straight away in his jacket (smoking jacket which had patches on the sleeves,)” she recalled. Having lived in Europe for nearly 18 years, LK returned to Sri Lanka in 1989 to pursue a legal career (patents and trademarks being his area of expertise) and was appointed President's Counsel in 1991. Living in a remodelled home on Havelock Road, he was back among family, old friends and colleagues. Nobody ever thought that he would step into politics as he had courteously refused many an invitation extended to him soon after he returned to Sri Lanka from Balliol College, Oxford, in the early ‘60s. Ajita recollected how she gathered information on the subject through the process of writing the autobiography of father. However at last upon the invitation of CBK in 1994, he made a crucial decision which not only changed his life but also the course of the country's history. The outcome finally cost him his life 11 years later, but made him a hero forever, a man of irreducible worth to whom every peace-loving Sri Lankan owes immeasurable debt. “Everything had to fall into place to fit perfectly for him to feel okay,” Ajita opened up about LK's decision which however came as a total surprise to her. She still remembers the phone call his father made to inform her about his decision and the conversation she had with him more than a decade ago. “I am calling to tell you that I have been invited to join the SLFP,” he said. “What? And you said no right?” she asked. “No, I have accepted [the offer] because it is time for a change. Something has to change and I feel that I can do something,'’ he said. She paused for a while after sharing ‘the destined conversation’ with the Daily News. “He was a very political person always, and knew everything that was going on. He had such a huge network. But for him to get into politics? We were shocked because I don't think he really thought either party at that time was doing much good. But I guess he decided ‘okay I should help and try to make a difference...” she went on. “I would have assumed that he would have joined the other side, had he ever wanted to get into politics. 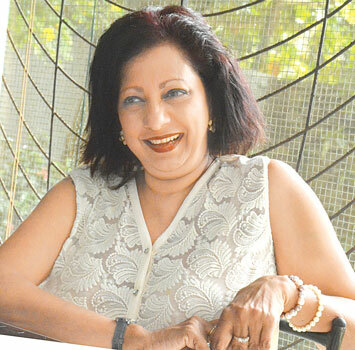 None of us never ever thought that he would join the SLFP,” she reiterated. LK's brother served as Navy Commander during Sirima Bandaranaike's regime, but his decision to join the SLFP, not the UNP, was not the least affected by that, Ajita confirmed. However as he progressed on his political journey, he gradually detached himself from his family, as he became busier day by day. Security measures were being intensified as he soon became a primary target of the LTTE. Having dedicated his once carefree life to a goal which he believed was worthier than life, he became more and more engrossed with his ‘role’ and was committed to it to the very end. He believed passionately in a united and democratic Sri Lanka in which all people would live with dignity and freedom. I very much doubt he was killed by the LTTE. Rajapaksa and his racist gang was behind the assassination. Power and politics was the motive here.